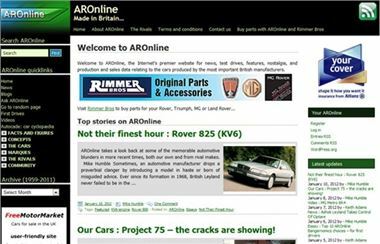 We’re pleased to announce a new partnership with AROnline, the leading website dedicated to British-built cars. The popular site was established more than ten years ago and focuses on both modern and classic British vehicles. The well respected site has a reputation for its forensic analysis of the post-war British car industry, and offers in-depth histories of particular models. It continues to expand, with the aim of including all UK-built post-war cars, as well as cars sold by companies with significant UK investment. As a partner to Honestjohn.co.uk, AROnline is a perfect match – it focuses on classic, used British cars while Honestjohn.co.uk focuses on the needs of modern buyers. It’d driven by the concept of sustainable motoring and the belief that driving should be fun. You can visit AROnline by clicking here.